Well of Wonders slot doesn't have the traditional reels of usual slot games but 'projects' 7 symbols onto the background of which you need 3 or more to match. There is a background of an enchanted fairy tale woodland centred upon a stone well engraved with mysterious runes out of which the 7 symbols appear when you play. I am not sure what the icons actually are, as they resemble possibly forest fruits or cakes - it is difficult to tell other than they are all brightly coloured! Well Of Wonders is in fact modelled on Thunderkick's extremely popular Fruit Warp, but can we expect an equally good reception for this game? So, you get paid for any matching symbols of 3 or more up to the maximum 7. The best 7-of-a-kind win is the red gem (in a hat?) which awards 50x stake but only 0.7x stake for the minimum 3 matching. The lowest payers are the blue (rune stones?) which pay 8x stake for 7 but only 0.2x stake for 3. There is a reason for these low pays, and that is each successive win removes the winning symbols and replaces them afresh, each time doubling the multiplier for the next win. You start on a basic 1x and then successive wins award 2, 4, 8 16 and finally the peak 32x multiplier which is displayed on the stones that surround the well. There is a Wild which can appear too. This formula is an exact replica of the Netent slot Big Bang, and so we see the idea for the game - a hybrid of Fruit Warp and Big Bang! 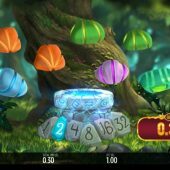 There are no free spins unlike in Fruit Warp and the only feature is in-play: a Fairy may appear on a losing combination, remove all single symbols and increase the multiplier one level for in effect a 'second chance' respin. And that's all folks!